US attorney Scott Brady said Pittsburgh attacker Robert Bowers will make an initial appearance before a judge on the afternoon of October 29. 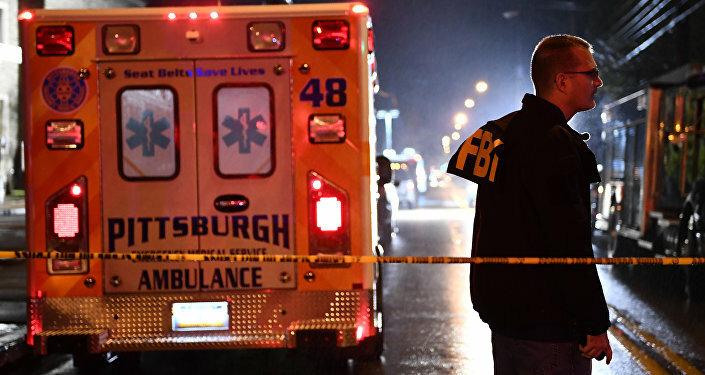 US officials have held a press conference, making statements about the Pittsburgh gunman who killed eleven people in a synagogue. As US attorney Scott Brady stated, the Pittsburgh synagogue shooting suspect made statements about genocide and his desire to kill Jewish people, telling an officer that he "wanted all Jews to die and also that they were committing genocide to his people." Brady stressed that the suspect "will be held fully accountable." The attorney has also noted that there is no indication the suspect was working with anyone else. "We are treating it as a hate crime… There is no indication that he is working with anyone else. And so we have charged it and are treating it as a hate crime but continue to investigate," he told reporters in a televised statement. Speaking about the victims of the tragedy, the attorney noted that all eleven victims of the shooting have been identified. The briefing is taking place just a day after Robert Bowers opened fire inside a synagogue in Pittsburgh, Pennsylvania, killing 11 people and injuring six others, including four police officers. The Saturday attack is estimated to have lasted 20 minutes. Robert Bowers walked through the Tree of Life synagogue, shooting at people in three locations. The gunman was detained as he exited the building after being injured in a shootout with police. He remains in fair condition with multiple gunshot wounds.